Not everything I make works out. Nor should it. If you want to learn how to cook creatively you have to expect some disappointments. What you see here is what I am calling the Ultimate Beet Salad. And I do not mean ultimate in the sense of best, but more in the sense of last. There are a lot of good ideas here; too many good ideas as it turned out. Pretty much the only thing that is not in this salad is the kitchen sink. And I'm surprised I showed that little bit of restraint. Here's what happened. I was on my way home from work last Monday, feeling a little worn down and lackluster. Work has been rough the past few months, as I'm sure it's been for a lot of people out there. I had not gone to the grocery store over the weekend and I had nothing either prepared or planned for dinner. I had all but decided to just order in, something I rarely do these days. And once I decided to have something delivered, all thoughts of health flew out the window. I was trying to decide whether to order pizza or a burger when my feet turned me into the parking lot of Treasure Island before I even knew what they were doing. In the produce section, the minute I saw a bunch of fresh ruby red beets I thought, "Yes. Beet salad." The lettuce, celery and red onion were no-brainers. I had oranges and walnuts at home. And then things kind of took on a life of their own after that. I was a woman on a mission as I went back and forth through the aisles, and by the time I was done I had added fennel, potatoes, oil-cured olives, fresh mozzarella, and pancetta to my basket. I decided to roast the beets and the potatoes so I prepped them and got them in the oven while I washed the lettuce and got everything else ready. I threw the pancetta into the skillet and got it going so it would be nice and crispy. 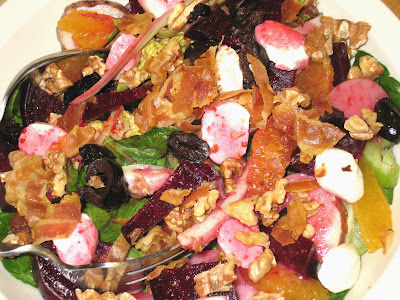 I used the juice from the roasted beets and the supremed orange in the vinaigrette. I put everything in the bowl and dressed the salad. After much anticipation, I finally dug in my fork and took a bite. And it was . . . ok. Not great. There were too many conflicting flavors and textures going on. It would have been much better without the potatoes, and the pancetta was wasted. The olives were too salty for the rest of the mix (which I guess is what I get for buying salt-cured olives). So I had to make sure I got a good mix on the fork. Luckily, I kept most of the ingredients separate, so after the first night I was able to leave out the potatoes, mozzarella, pancetta, and olives. The potates and olives made a nice side dish with the orzo with Italian Sausage and Mozzarella I made for dinner later in the week, and the pancetta topped my scrambled eggs for breakfast Sunday morning. It wasn't a total loss. I will certainly continue to make beet salads, I will just put back the last three or four ingredients before I leave the store.